I'm stuffed, the kids are crashed (The Boy on the couch, Oldest Daughter on the floor), and I'm about ready for bed myself. It was a relatively small gathering this year - there were only 20 of us - but we ate and laughed and then ate some more and laughed some more. In case you're curious, we had deviled eggs, green beans, brisket, turkey, cornbread dressing, sweet potatoes, twice baked potatoes, spicy corn pudding, rolls and cranberry sauce. And pie, of course - apple, pecan and cherry. And cheesecake. And cupcakes. And blueberry tarts. You know it's a good meal when you have as many desserts as you do side dishes. That link led me back to you web page. I really enjoyed seeing it again. (I sure I must have looked at it long ago.) I'll visit it again to see more. 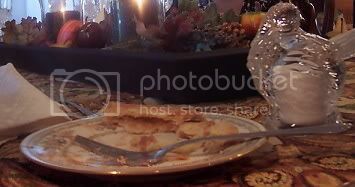 Enjoyed your Thanksgiving photos. You had on black boots, right? I am so behind in updating my website - hopefully I'll be able to work on it some over the holidays. Yes, that's me on the right in the boots picture. My mom is sitting in the middle, and my cousin is the one with the broken leg. As many desserts as side dishes definitely means a great meal! Terrific pics!! And yes, yummy desserts make the meal. Man the kids are grown. How'd that happen? ?